Grace has been MIA this morning, so we’re getting a bit of a late start with her interview of Christiana Miller. 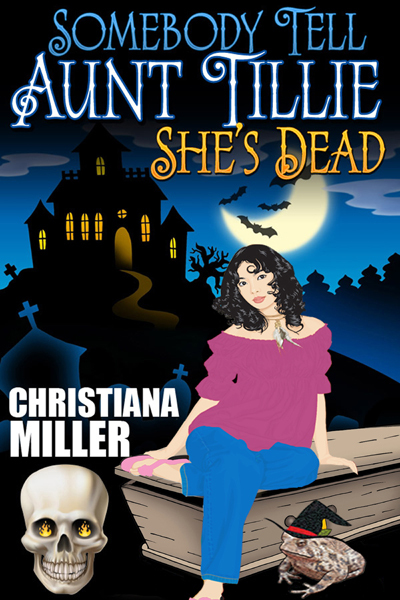 So, quickly, here’s the description of Christiana’s Somebody Tell Aunt Tillie She’s Dead, a paranormal chick-lit novel for adults. When Mara accidentally releases a demon and awakens the spirit of the most powerful witch in history, Tillie’s ready to kill her — literally. It’s the only way she can think of to save the girl from herself. The witch and the demon, however, have other plans for Mara’s body! Now, without further delay, here’s Grace and Christiana. Hey there! Your novel sounds like so much fun, but it’s probably off-limits for teens. And Angels. And especially teen angels. Still, your Muse must be doing a great job inspiring you. What’s the next project she’s helping you out on? My muse and I are currently arguing over the next book. She wants me to work on the Tillie sequel, I want her to help me finish the Gospel of Ruth. So, she’s been dragging her twinkle-toed shoes. I may need to bribe her with a trip to Disneyland. That’d probably work! Muses are so finicky sometimes. And sometimes they just need new ideas for the characters. Which of your characters are you most like? I’m most like Mara. I’m always leaping headfirst into new situations and figuring things out as I go along. Hmmm…*whispers behind a cupped hand* Don’t tell anyone, but I’m a little like that. Let’s move along to the next question if that’s all right with you. What’s your favorite book of all time? *sighs* Yes. Just one. Everyone keeps asking me that. Will you pick one? That kinda changes by the day. I’m always finding new favorites. And I love to re-read old favorites. But my most favorite YA series is The Dark Is Rising series by Susan Cooper. The books rock. I can’t wait until my daughter is old enough for them. That is very, very, very nice that you want to share with your daughter. When she gets older she’ll probably start dating, too. If you could pick a swoony-worthy guy for her, what would he be like? If he’s fun to be with, he has a great sense of humor, he’s smart and he’s romantic. And loyal. Nothing beats a guy who’s intelligent, who makes you laugh, who always has your back and who has a streak of romance in his soul. Oooh…you’d pick a good one for her!! Next question. If you could go to a rock concert in Heaven, who would you go see? Only one? That’s a tough one. No….you can create something all your own. There’s Freddie Mercury, John Lennon, Janis Joplin, Jim Morrison, Elvis… Actually, I’d want a ticket to a Dead Rockstars Review, featuring all the dead rock stars. Kind of like an otherworldly Oz-fest. And I’d definitely throw in some jazz and blues. But if I could only go to one concert, of any genre, I’d pick Billie Holiday. You picked a lot of the same people as Marie Symeou and there are a bunch who want to see Elvis. The Dead Rockstars Review is an excellent idea. I’m gonna put that in the Paradise Suggestion Box. Okay, but before I do that. Confession time. What’s your biggest writing sin? Procrastination. It’s too easy to get your time sucked away by everything else that comes up — whether it’s writing-related (like marketing or research) or life-related. There just never seems to be enough time to get everything done. You’re in good company. We’ve already decided to form a support group for this. As an Angel, I’m required to ask: Are you more of a rule follower or a rebel? Why? LOL! Well, I’m an indie author, so I’m going to go for rebel. I’ve learned that mindlessly following the rules and limiting your path to how things are supposed to be done, or how they’ve always been done in the past, can literally eat up years of your life and give you nothing to show for it. Figure out what you want and forge your own path. Awesomesauce, Christiana! It’s great to meet a fellow rebel and fellow procrastinator! Now, other than picking your own path, inspires you? My daughters — my grown-up girl and my baby girl. When I grow up, I want to be just like them. Aww…that is incredibly sweet and really you shouldn’t ever grow up. Being childlike is such a nice quality to have. Truly. Do you have any special themes you want readers to take from your books. I’m a big fan of escapist entertainment. So, if readers get to forget about their own lives for a few hours and get caught up in the lives of the characters, then I think the book is a success. If they learn something they didn’t know to begin with, it’s a bonus. And if they leave feeling empowered to take charge of their own lives… that would be awesome. Sounds like we have a lot in common. I’m a big fan of escaping, since I escaped to earth and a big fan of empowering, since I have so many powers. Thanks for being so patient with my delay (procrastination?) this morning! And, one last thing. Is there anything you’d like me to mention to your Guardian Angel? ‘Cause I totally have contacts. Hmmm. Let me think… Tell her I said great job so far, but she may want to hire help. I’ve gained some weight, so I think I weigh about two angels-worth right now. Aww, Christiana...I’m sure one Angel is enough. And I’m going to pass along compliment, because she’ll love to hear that! Hey, All! Isn’t Christiana great? If you’re old enough check out her book on Amazon. May 4, 2012. Tags: author interview, books, Christiana Miller, confession, guardian angel, inspiration, Shel Delisle, Somebody Tell Aunt Tillie She's Dead, Winging It!. author interviews. Great interview Christiana–and Grace! Couldn’t you just talk to Grace all day? I’m putting Tillie on my TBR list.Nice to meet a fellow rebel! May 7, 2012 at 11:02 am. Permalink. March 6, 2013 at 4:05 pm. Permalink.